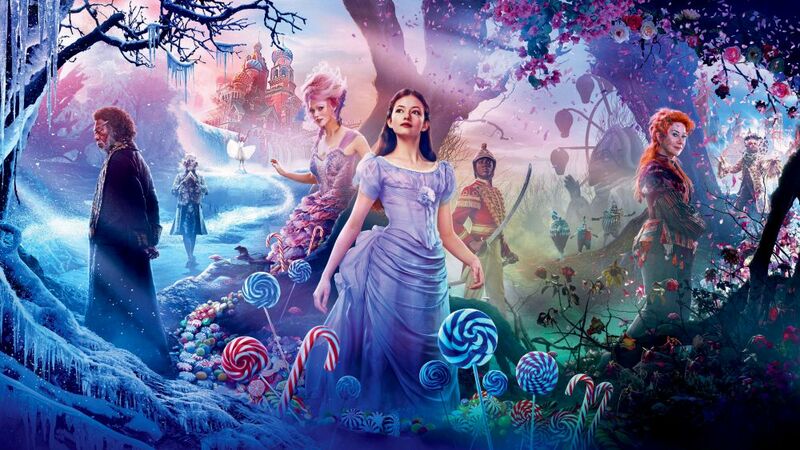 If you read my previous article on The Nutcracker and the Four Realms, you may have noticed that I didn’t review the movie, but rather the venue where I saw it. That’s because the presentation at that theatre was lovely, but the actual film, not so much. Outside of the absolutely stunning visuals, which really are special, there’s nothing else to recommend it. 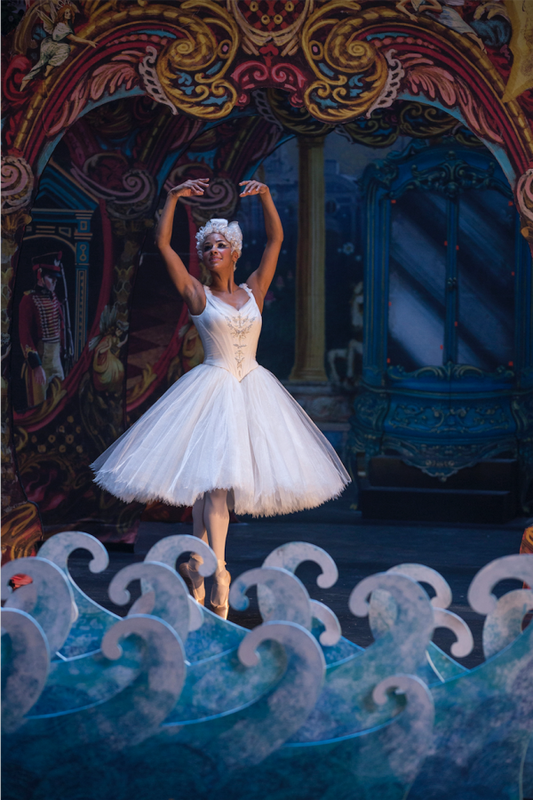 First of all, and perhaps most importantly, it’s not the real story of The Nutcracker. It actually has nothing to do with that classic tale at all, other than that the girl and the toymaker have the same names. And there are toy soldiers and mice. Lots of mice. Lots and lots of mice. While the actual written story, which goes back to 1816, and the libretto for the 1892 ballet vary a bit, neither one is even close to the very idiotic story this new film is putting out. This one is annoying and tedious. I was shocked to learn later that it’s only an hour and forty minutes; it felt like at least three hours! Worst of all, especially for a holiday and/or Disney film, it’s absolutely soulless. Clara flanked by her father and sister at the Christmas party. It’s being marketed to families, like children know what a “realm” is!!! Guess what? They do not. So even the title is stupid! The most egregious offense of all is that—there’s hardly any dancing! Who goes to see any version of The Nutcracker not expecting to see lots of beautiful ballet??? That answer is—no one! No wonder The Nutcracker and the Four Realms has been a complete bust! Well, financially, anyway, with it just about breaking even worldwide at this point. Then there are the brief moments of Misty Copeland’s exquisite ballet dancing. I highly suggest we all always take any chance to see Misty Copeland dance, even if it’s for just these few minutes. 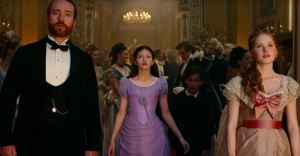 And I really appreciate that The Nutcracker and the Four Realms opens with a nod to Fantasia, Disney’s third animated feature, by having the conductor begin the proceedings, just like in that early film. There is one line early on in the script with which I totally identified. Clara’s father tells the children, “Christmas comes whether we like it or not,” because this is the first Christmas without their mother, who had passed away earlier that year. (Another nutty deviation from the original tale, but it’s the incident on which the entire saga is based, so oh well.) That’s exactly what I’ve had to deal with in the past seven years since my mother died…on Christmas, which had always been my favorite holiday. That’s a trauma one does not ever get over, trust me. 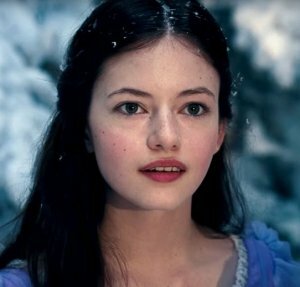 Mackenzie Foy as Clara. Look at the black line over her lip! 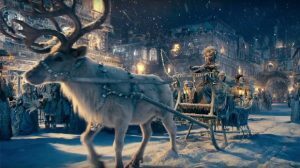 Speaking of traumas, this comment is not about the actual film, but visuals in it reminded me of this: It always boggles my mind when I see that, in the olden days, people decorated Christmas trees with…live candles! How did everyone’s homes not go up in flames, thus canceling the holiday for all time? And how did the masses not realize how dangerous that practice was?! Speaking of upper lips, what is up with the nutcracker’s gold above-the-lip-lipstick??? I kept hoping he would wipe his mouth every time they showed the dude!!! Jayden Fowora-Knight as the Nutcracker, with his crazy lip make-up! And what was American Morgan Freeman doing in there as the toymaker, and one of her mother’s best friends for life, when everyone else is British? Again, diverse casting desperation, I fear. 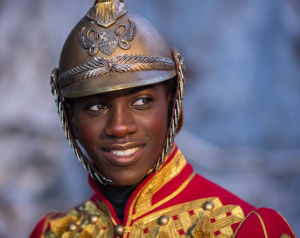 Okay, now that you know all this, and your expectations are lowered sufficiently, I say that, if you do plan to see The Nutcracker and the Four Realms, you must see it on a big screen. Dot, dash, end of story. So you had better hurry, because I have a feeling it will go quickly to video!